Who doesn’t love the smell of espresso in the morning? What if you could get quality espresso anytime you want, in your own kitchen choosing the best coffee machine for your needs? The Nespresso Citiz D111 is a programmable automatic espresso machine for use with single-serve Nespresso capsules. The D111 benefits from a superfast heat-up time of just 25 seconds and energy-saving features, such as automatic shut-off after nine minutes of inactivity. The D111 produces both espresso and lungo, but does not have a milk foamer built in. You can load up to ten capsules at a time for easier storage. Spent capsules are automatically ejected into a built-in drawer which has capacity to store up to 11 capsules for environmentally responsible disposal. If you want to steam/froth milk for lattes and cappuccinos, etc., Nespresso sells the Aeroccino separately. Nespresso sells the D111 with a starter pack containing 16 coffee capsules, which should be included with any machine bought new. A variety of capsules can be purchased separately through Nespresso or from other retailers. Be aware that while there are lots of capsules on the market advertised as ‘Nespresso-compatible’, you’ll probably find they don’t work with the D111. The Citiz D111 is a well-built, compact and versatile entry in this popular Nespresso range. Whether you choose the cheaper black or red models or splash out on the silver chrome version, the D111 is value for money and offers good functionality, without many of the bells and whistles of higher priced automatic capsule espresso machines. If you’re a fan of capsule coffee, or you want to take your first steps into this convenient and hassle-free way of making espresso at home or work, you’ll find much to love in the D111. The modest price tag also means that if you’re a regular coffee drinker, you’ll probably find the D111 pays for itself in no time. Handy features include the option to load up to ten capsules into the machine (a real help for those rushed workday mornings) and also capacity to store up to 11 spent capsules, which drop into a removable built-in storage unit for easy collection and recycling. As to the quality of the coffee produced by the D111, it’s really hard to go wrong with capsules. Indeed, all the elements are in place, including crema and aroma. With Nespresso you also get the bonus of a stronger brew than with some other capsule machines makers (such as those beginning with a ‘K’!). Truthfully, it’s hard to hate the taste of Nespresso capsule coffee, especially if you’re partial to a robust brew. Of course, one big advantage of capsule coffee is that you can try lots of different styles, strengths and blends until you find the ones you like. That being said, capsule coffee is not for everyone. If you love your specialty coffee and subtle notes, you’ll likely hate pre-ground capsule coffee. If you love your Starbucks, capsule coffee is the ideal home or office solution. In fact, given its slim design, the D111 is an especially good choice for an office environment. For anyone unfamiliar with how capsule coffee works, you simply purchase the Nespresso pods of your choice, slot one into the compartment when you fancy a brew and press the button. Within seconds, you can be enjoying your espresso beverage – no mess, no fuss. The capsules are single serve. The D111 comes with a removable water tank, which you pre-fill with water, and the unit heats up in around 25 seconds. With the D1111, you get the option to dispense a single shot espresso (1.35oz) or double shot/lungo (3.7oz). You can stick to the factory settings, or you can reprogram the D111 with custom water volumes (and put them back to factory settings again if you change your mind). You can remove the external pieces of the D111, including cup holder, used capsule container and drip tray, for easy cleaning. The outside of the D111 can be wiped down with a soft damp cloth. Periodically, you’ll need to get out the descaler and clean the inside of the machine. Nespresso recommends you descale the D111 every 300 to 1200 cups, depending on water hardness. The descaling process takes around 15 minutes. In all honesty, it’s really hard to find anything particularly wrong with the D111. The machine quickly and easily produces espresso coffee in no time and looks nice sitting on the counter. Really, what more could you want? A few minor negatives include the foldable drip tray, which has the tendency to fall down. In addition, there’s no ‘off’ button. Instead, you have to turn it off using the espresso and lungo buttons located at top of machine (or simply take advantage of the automatic shut-off feature). It’s also worth pointing out that a number of third-party reviews have highlighted occurrences of the machine dripping liquid for some time after the beverage has dispensed. Other than that, negatives about the D111 concern the wider issues of capsule coffee. For consumers concerned about the environmental impact of single-use capsules, it’s worth noting Nespresso does have a recycling program and you can separate out the individual elements – coffee grounds, foil lid and aluminum pod – for specialist recycling. While not endorsed or recommended in any way by Nespresso, there are supposedly ways to refill the capsules to prevent the single-use waste generated by these over packaged pods. If you’re looking for a quality capsule machine that’s built to last, the Citiz D111 is certainly a fine choice. 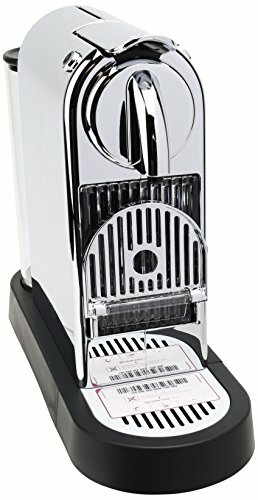 Arguments for and against capsule machines notwithstanding, with the Citiz D111 you can become a fully-fledged member of the ‘Nespresso family’ at a reasonable price. Given its quick heat-up time and compact, retro design, this is a good option for both home and office use. That being said, if you’re looking for more features and flexibility, there are other models in the Citiz range that might be a better fit, such as those which come with Aeroccino milk frother build-in. Pros: The Citiz D111 boasts one of the fastest heat-up times for a machine of its type. The D111 is also versatile, offering a range of espresso and lungo-making options. Nespresso has put a lot of thought into building a sturdy machine that offers convenience and handy features, while keeping the D111 at a price that puts it within reach of lots of coffee-lovers. The machine is also aesthetically pleasing and opens up the world of Nespresso to consumers who want to explore capsule coffee. Cons: The D111 comes without milk steaming capabilities, which does mean the extra expense of investing in the Aeroccino (or similar) for making milk and espresso-based drinks. The foldable drip tray has the potential to be pretty annoying and there have been a handful of third-party reports of the machine dripping after the espresso has dispensed. Many coffee lovers are generally critical of the quality of capsule coffee (but that comes down to personal taste, rather than the quality of the D111 itself). In a sentence? 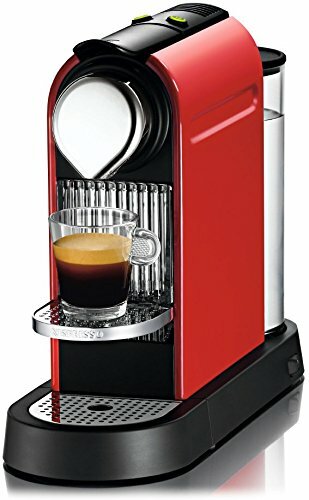 This is a sleek, sturdy and versatile machine that performs as advertised, producing a variety of single-serve espresso-based beverages at the touch of a button – if you want the convenience of capsule coffee and the ability to make espresso at home, the Citiz D111 is a solid choice at a price that reflects the quality and features on offer.